Summerlicious dictates that any restaurants participating need to have options for all 3 courses available. There also needs to be a vegetarian option available which draws a greater group of customers. 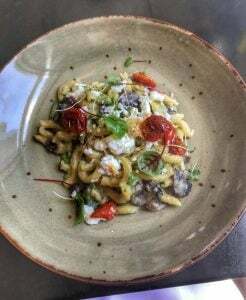 Ricarda’s lunch prixe fixe for Summerlicious 2018 comes at a price tag of $28. There was also the option of adding on 3 glasses of wine for $23. This was an unusual surprise as I have not seen other restaurants also pair a drink special. I had heard good things about the restaurant and was pleased that they were accurate. The decor itself is contemporary and cozy, subtle Art Deco features and details compliment the building the restaurant is housed in. There is also a Ricarda’s cafe attached with take out food options, while it’s merged with the restaurant there are two defined areas and the main dining area does not feel like it’s in a cafeteria type atmosphere at all. Even though it was lunch I treated myself to a cocktail. The Nevermind definitely is not as blasé as it sounds. 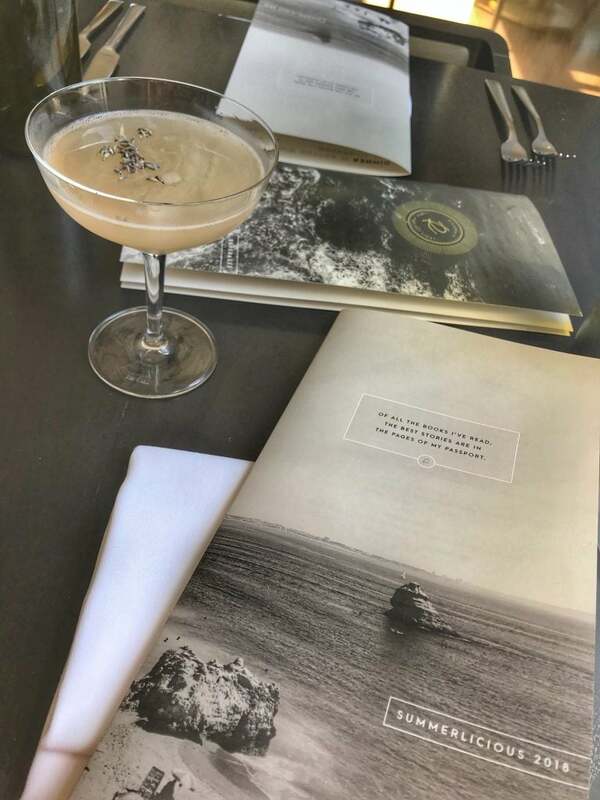 Chamomile infused gin, St. Germain, lavender, and lemon created a very easy to sip libation. At $14 though, I had to force myself to pace it so that it didn’t go down too fast. My appetizer was their spicy seared beef. 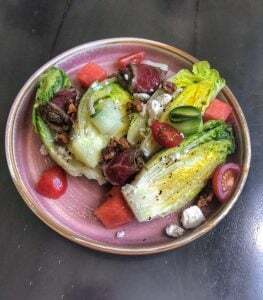 It came with baby gems, cucumber, watermelon, crumbled feta, and candies pecan nuts. It was the perfect light starter to a hot summer day. The only observation was that the seared beef was actually not spicy at all. I was content with that as I’m not big on spice, but others may be disappointed, there wasn’t even the slightest hint of a kick. I followed up the starter with their vegetarian garganelli dish. This consisted of asparagus, spring mushrooms, sundried tomato, goat cheese curds, mandarin zest, and Parmesan broccoli purée. This dish was excellent! The mandarin zest especially gave a really nice subtle citrus note with each bite. I would say it actually needed a bit more or the zest because after the first couple bites I lost any trace of it, I imagine it had only been on top slightly. This is a dish though that I would order again and again, I hope it stays on their a la carte menu at the completion of Summerlicious. Finally for dessert I had the Montblanc. I wasn’t sure exactly what to expect. The description was simply raspberry/honey. Montblanc traditionally consists of a lot of whipped cream, this was consistent with that. It was quite rigid and cold in the middle which I enjoyed but I don’t know if it was intention on the part of the kitchen or if it had been frozen overnight and wasn’t quite thawed yet. Either way it was light and satisfying. All dishes worked well together and were appropriate ingredients and portion sizes for the heat of the summer. 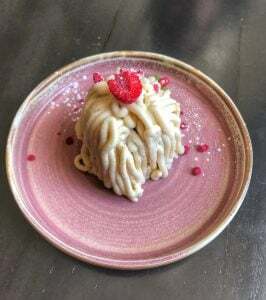 You still have time to visit before the prixe fixe disappears as Summerlicious is on until July 22 2018. There is also a dinner prixe fixe available at Ricarda’s during this time for $43cdn. Website and reservations available HERE.